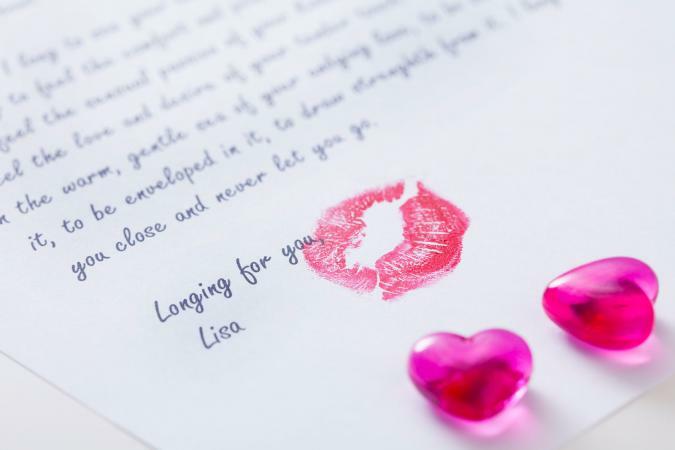 Getting all those emotions you feel in a love letter for him can be brutal. But a love letter for a boyfriend is a perfect way to express all your feelings and show him just how much you truly care. Whether you just miss him, it is a special occasion or just because, find the perfect words to display your undying love. It was two years ago tonight that you first told me you loved me and asked me to be your girlfriend. You changed my life that evening and put us on a path that has brought us such joy. When I look at you today, I realize my love for you grows deeper, richer, and more satisfying as time goes by. Whenever something good happens, you're the first person I want to tell. When something bad happens, I know that I can count on you to take me in your arms and tell me everything will be alright. I'm the luckiest woman in the world because I can truly say that I'm in love with my best friend. There's not another man in the world that can hold a candle to you, my darling, and I just wanted let you know that I love you more than even the most heartfelt words can express. With love from the one who adores you. Being apart from you is more difficult than I ever imagined. I see reminders of you everywhere I look, and they make me ache to be near you again. I love you with all my heart. I cherish every moment we spend together, and I love you even more in the moments when we are apart. Tonight as I write this letter, it's like you are right here with me. I feel your hand on my shoulder, your fingers in my hair, and the soft breath of your kiss on my cheek. I miss you, darling. Come home soon. Today is your birthday, and I just wanted to take a moment to tell you how much I love you. Just being with you has made all my dreams come true, and I want to do everything I can to make you feel that way too. You deserve to be treasured for being the sweetest, kindest, most thoughtful boyfriend any girl could ask for and believe me, I do treasure you. I hope we will celebrate your birthday together each year for the rest of our lives. Happy Birthday from your sweetheart. I realize that I overreacted last night, and I just wanted to tell you how sorry I am. The truth is, I can't picture my life without you. When you walk into the room, my heart beats a little faster. When I hear your voice, I melt a little inside. And when I see your sweet face, I know that you are my one true love. When you take me in your arms, it feels like coming home to the only place I belong. Please forgive me and let me make it up to you tonight. If you wonder just how much I love you, wonder no more. You are the sun in my sky, the river that runs through my soul, and the very air I breathe. Before I met you, I didn't believe it was possible to love someone so deeply and completely, but you have given me faith that true love really does exist because I share it with you. You are the most fortunate man on the planet because you receive a Dear John letter anytime someone writes to you. You are luckier still because my Dear John letters are unmatched in their love, appreciation, and tenderness. You send me flowers, I send you a Dear John. You give me tickets to my favorite musical, I give you a Dear John. You give me diamonds for my birthday, I give you a Dear John. Love you always, my dearest John. You were already on my mind when I woke up this morning. Funny how I just can't stop thinking about you. Six months ago we hadn't even met, and now you are the most important person in my life. So, I just wanted to say I love you, and I can't wait to see you again. You always ask me why I love you, so I decided to write it all down so you can keep it and read it whenever you feel the need. I love your sense of humor. It's one of the first things I noticed about you. You have a way of putting people at ease with a simple joke, and you always include everyone in the fun instead of using your humor to put someone down. I love your optimistic nature. You always try to see the good in every person and situation, even when I can't see it myself. When I look at the world through your eyes, it's a better place. I love the way you look. You're so handsome, but you don't seem to realize how good looking you are. I see the way other people look at you, and I know they envy me for being with you. I'd love you even if you weren't so darn handsome, but I'm glad you are. I love your gentle hands. You're such a strong man, but you have such a soft touch. When you take my hand in yours, I feel safe and cared for. I can't tell you how wonderful that is. I love your generous soul. Whenever someone's in need, you're the first person to lend a hand. Some people might think you're a little too generous and easily taken advantage of, but I know better. You just can't resist helping because you understand how easily you could find yourself in the same situation. I love the way you kiss me. Your lips perfectly fit with mine. I love those quick kisses you shower me with throughout the day, and I love your deep, lingering kisses even more. They make my toes curl, and I shiver with delight. Most importantly, I love the way you complete me. You are my the soul mate I thought I'd never find. You cheer me up when I'm down and help me find balance when my world is out of control. You make me want to do the same for you. When I think about all the reasons I love you, I begin to wonder why someone as special as you, loves me. Maybe someday you'll write a letter for me. I'm so excited we're about to spend our first Christmas together. This has always been my favorite holiday, but it will be even more special this year because we'll share it together. I cannot wait to sit by the tree with you on Christmas Eve, share a little wine, watch the lights twinkle, and open our gifts to each other. We can visit friends and family Christmas Day, but let's make Christmas Eve our own private celebration. I hope this letter finds you safe and sound. I know you've only been deployed for a few weeks, but it already feels like an eternity. I miss the sound of your voice and being able to look at you and share a smile. I still haven't washed the shirt you left at my place because it smells like you. I like to put it on and imagine your arms are wrapped around me. You're the first thing I think of when I wake in the morning, the last thing I think of each night, and you're always in my dreams. Even though I worry, I hope you know how proud I am of you and the sacrifice you're making for our country. You're the strongest, bravest person I know, and those are just a few reasons why I love you. I'll tell you the rest when you come home. Until then, stay safe my love. I always dreamed of having a boyfriend, and I used to ponder what he'd be like. I imagined he'd be handsome and funny, and he'd be a great person too. Now you're here, and all my dreams have become a reality. It's so wonderful to have someone special to share everything with. You laugh at my dorky jokes, and we love listening to the same music. I feel like I can tell you anything, and you understand exactly where I'm coming from. I've never been so happy, and it's all because of you. I hope you feel the same, and I promise I'll try to be the best girlfriend you'll ever have. I can remember the day we met like it was yesterday. We were at that party. I was having a drink and talking with a few friends when I randomly looked around the room. My eyes stopped on you, and my heart felt a rush. You happened to look over at the same moment and smiled at me. The minute I saw your smile, I knew I had to get to know you. I went back to talking to my friends and trying not to let my excitement show, but my heart was beating so hard I found it difficult to hear the conversation. One of my friends asked me if I was all right because my face looked flushed. I turned my head, so you couldn't read my lips, and I told her, "I think I just fell in love with that gorgeous redhead over by the window." Of course, she had to take a look, and I grabbed her by the hand and dragged her to the kitchen with me because it was so obvious I was talking about you. You walked into the kitchen a couple minutes later to add some ice to your glass, and there I was, wishing I could think of something witty to say. When it became obvious I was completely at a loss for words, you broke the ice by saying hi and flashing another one of those brilliant smiles. I managed to say hi back to you, and that was the beginning of a lovely conversation that has been going on for a little over a year now. To think, it all started with your smile. When you're trying to figure out how to write a letter to someone you love, you may find that mere words don't express how you truly feel. You might get frustrated when your sweet love letter for him comes out sounding sappy and not at all what you wanted to convey. If you're not well-versed in the art of writing, you may feel as though your writing doesn't sound quite right. 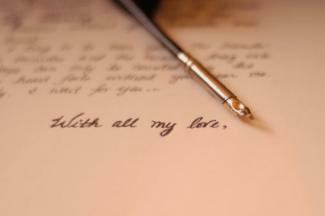 Here is the truth: when it comes from the heart, a love letter is always a romantic gesture. You don't need a strict outline, but at least compose a list of the things you want to make sure to mention within the letter. What are the things you want to say to your loved one? Think about the main reason you're writing the letter. Is it to simply convey your love, or are you celebrating something specific like an anniversary or milestone in your relationship? Is your loved one having a difficult time at work and can use an emotional boost? Whether you're writing a brief love paragraph for your boyfriend or a long, epic letter, keep your motivation in mind when you make your preparatory list of the things you want to mention. Compose a first draft where you just pour out all you emotions onto the paper (or screen), keeping your notes in mind and don't worry initially about grammar, spelling, or even how the letter sounds. After you're finished writing, walk away from it for an hour or so - a day is great, if possible. This allows you to review it with a clear perspective and see if it's along the lines of what you want to present. Read the letter out loud to yourself to hear how it really sounds. If you said these things to your loved one face-to-face, would they make sense and do they really express your feelings? Tweak anything that doesn't sound right and clean up the grammar and spelling. Write or print the final draft of the letter on attractive paper with romantic font or handwriting. Hand deliver it or leave it somewhere it will be found. As you can see from these samples, writing a love letter can be as simple or dramatic as you want it to be. You can even add personal touches like enclosing a photo of the two of you or misting the letter with a little of your perfume. The truly important thing is to say what's in your heart and say it in your own words so they ring true when your boyfriend reads them. If you get it right and your passion shines through, you just might receive a love note from him in return where he says how he feels about you.